For the TV miniseries, see Japanese Americans (miniseries). Hawaii, the West Coast and urban areas elsewhere. Japanese Americans (日系アメリカ人, Nikkei Amerikajin) are Americans who are fully or partially of Japanese descent, especially those who identify with that ancestry, along with their cultural characteristics. Japanese Americans were among the three largest Asian American ethnic communities during the 20th century; but, according to the 2000 census, they have declined in number to constitute the sixth largest Asian American group at around 1.4 million, including those of partial ancestry. According to the 2010 census, the largest Japanese American communities were found in California with 272,528, Hawaii with 185,502, New York with 37,780, Washington with 35,008, Illinois with 17,542, and Ohio with 16,995. Southern California has the largest Japanese American population in North America and the city of Torrance holds the densest Japanese American population in the 48 contiguous states. People from Japan began migrating to the US in significant numbers following the political, cultural, and social changes stemming from the Meiji Restoration in 1868. Large numbers went to Hawaii and later the West Coast. In 1907, the "Gentlemen's Agreement" between the governments of Japan and the US ended immigration of Japanese unskilled workers, but permitted the immigration of businessmen, students and spouses of Japanese immigrants already in the US. The Immigration Act of 1924 banned the immigration of nearly all Japanese. The ban on immigration produced unusually well-defined generational groups within the Japanese American community. Original immigrants belonged to an immigrant generation, the Issei, and their US-born children to the Nisei Japanese American generation. The Issei comprised exclusively those who had immigrated before 1924. Because no new immigrants were permitted, all Japanese Americans born after 1924 were—by definition—born in the US. This generation, the Nisei, became a distinct cohort from the Issei generation in terms of age, citizenship, and English-language ability, in addition to the usual generational differences. Institutional and interpersonal racism led many of the Nisei to marry other Nisei, resulting in a third distinct generation of Japanese Americans, the Sansei. Significant Japanese immigration did not occur again until the Immigration and Nationality Act of 1965 ended 40 years of bans against immigration from Japan and other countries. The Naturalization Act of 1790 restricted naturalized United States citizenship to "free white persons", which excluded the Issei from citizenship. As a result, the Issei were unable to vote and faced additional restrictions such as the inability to own land under many state laws. Japanese Americans were parties in several important Supreme Court decisions, including Ozawa v. United States (1922) and Korematsu v. United States (1943). The Korematsu case originated the "strict scrutiny" standard, which is applied, with great controversy, in government considerations of race since the 1989 Adarand Constructors v. Peña decision. In recent years, immigration from Japan has been more like that from Western Europe. The numbers involve on average 5 to 10 thousand per year, and is similar to the amount of immigration to the US from Germany. This is in stark contrast to the rest of Asia, where family reunification is the primary impetus for immigration. During World War II, an estimated 120,000 Japanese Americans and Japanese nationals or citizens residing on the West Coast of the United States were forcibly interned in ten different camps across the western interior of the country. The internments were based on the race or ancestry rather than activities of the interned. Families, including children, were interned together. Four decades later, the Civil Liberties Act of 1988 officially acknowledged the "fundamental violations of the basic civil liberties and constitutional rights" of the internment. Many Japanese-Americans consider the term internment camp a euphemism and prefer to refer to the forced relocation of Japanese-Americans as imprisonment in concentration camps. Webster's New World Fourth College Edition defines a concentration camp as, "A prison camp in which political dissidents, members of minority ethnic groups, etc. are confined." The nomenclature for each of their generations who are citizens or long-term residents of countries other than Japan, used by Japanese Americans and other nationals of Japanese descent are explained here; they are formed by combining one of the Japanese numbers corresponding to the generation with the Japanese word for generation (sei 世). The Japanese American communities have themselves distinguished their members with terms like Issei, Nisei, and Sansei, which describe the first, second, and third generations of immigrants. The fourth generation is called Yonsei (四世), and the fifth is called Gosei (五世). The term Nikkei (日系) encompasses Japanese immigrants in all countries and of all generations. Issei (一世) The generation of people born in Japan who later immigrated to another country. Nisei (二世) The generation of people born in North America, Latin America, Hawaii, or any country outside Japan either to at least one Issei or one non-immigrant Japanese parent. Sansei (三世) The generation of people born in North America, Latin America, Hawaii, or any country outside Japan to at least one Nisei parent. Yonsei (四世) The generation of people born in North America, Latin America, Hawaii, or any country outside Japan to at least one Sansei parent. Gosei (五世) The generation of people born in North America, Latin America, Hawaii, or any country outside Japan to at least one Yonsei parent. The kanreki (還暦), a pre-modern Japanese rite of passage to old age at 60, is now being celebrated by increasing numbers of Japanese American Nisei. Rituals are enactments of shared meanings, norms, and values; and this traditional Japanese rite of passage highlights a collective response among the Nisei to the conventional dilemmas of growing older. Issei and many nisei speak Japanese in addition to English as a second language. In general, later generations of Japanese Americans speak English as their first language, though some do learn Japanese later as a second language. In Hawaii however, where Nikkei are about one-fifth of the whole population, Japanese is a major language, spoken and studied by many of the state's residents across ethnicities. It is taught in private Japanese language schools as early as the second grade. As a courtesy to the large number of Japanese tourists (from Japan), Japanese characters are provided on place signs, public transportation, and civic facilities. The Hawaii media market has a few locally produced Japanese language newspapers and magazines, although these are on the verge of dying out, due to a lack of interest on the part of the local (Hawaii-born) Japanese population. Stores that cater to the tourist industry often have Japanese-speaking personnel. To show their allegiance to the US, many nisei and sansei intentionally avoided learning Japanese. But as many of the later generations find their identities in both Japan and America or American society broadens its definition of cultural identity, studying Japanese is becoming more popular than it once was. Japanese American culture places great value on education and culture. Across generations, children are often instilled with a strong desire to enter the rigors of higher education. Math and reading scores on the SAT and ACT may often exceed the national averages. Japanese Americans have the largest showing of any ethnic group in nationwide Advanced Placement testing each year. A large majority of Japanese Americans obtain post-secondary degrees. Japanese Americans often face the "model minority" stereotype that they are dominant in math- and science-related fields in colleges and universities across the United States. In reality, however, there is an equal distribution of Japanese Americans between the arts and humanities and the sciences. Although their numbers have declined slightly in recent years, Japanese Americans are still a prominent presence in Ivy League schools, the top University of California campuses including UC Berkeley and UCLA, and other elite universities. The 2000 census reported that 40.8% of Japanese Americans held a college degree. A Japanese school opened in Hawaii in 1893 and other Japanese schools for temporary settlers in North America followed. In the years prior to World War II, many second generation Japanese American attended the American school by day and the Japanese school in the evening to keep up their Japanese skill as well as English. Other first generation Japanese American parents were worried that their child might go through the same discrimination when going to school so they gave them the choice to either go back to Japan to be educated, or to stay in America with their parents and study both languages. [page needed] Anti-Japanese sentiment during World War I resulted in public efforts to close Japanese-language schools. The 1927 Supreme Court case Farrington v. Tokushige protected the Japanese American community's right to have Japanese language private institutions. During the internment of Japanese Americans in World War II many Japanese schools were closed. After the war many Japanese schools reopened. There are primary school-junior high school Japanese international schools within the United States. Some are classified as nihonjin gakkō or Japanese international schools operated by Japanese associations, and some are classified as Shiritsu zaigai kyōiku shisetsu (私立在外教育施設) or overseas branches of Japanese private schools. They are: Seigakuin Atlanta International School, Chicago Futabakai Japanese School, Japanese School of Guam, Nishiyamato Academy of California near Los Angeles, Japanese School of New Jersey, and New York Japanese School. A boarding senior high school, Keio Academy of New York, is near New York City. It is a Shiritsu zaigai kyōiku shisetsu. There are also supplementary Japanese educational institutions (hoshū jugyō kō) that hold Japanese classes on weekends. They are located in several US cities. The supplementary schools target Japanese nationals and second-generation Japanese Americans living in the United States. There are also Japanese heritage schools for third generation and beyond Japanese Americans. Rachel Endo of Hamline University, the author of "Realities, Rewards, and Risks of Heritage-Language Education: Perspectives from Japanese Immigrant Parents in a Midwestern Community," wrote that the heritage schools "generally emphasize learning about Japanese American historical experiences and Japanese culture in more loosely defined terms". Tennessee Meiji Gakuin High School (shiritsu zaigai kyōiku shisetsu) and International Bilingual School (unapproved by the Japanese Ministry of Education or MEXT) were full-time Japanese schools that were formerly in existence. Before the 1960s, the trend of Japanese Americans marrying partners outside their racial or ethnic group was generally low, as well a great many traditional Issei parents encouraged Nisei to marry only within their ethnic/cultural group. Arrangements to purchase and invite picture brides from Japan to relocate and marry Issei or Nisei males was commonplace. In California and other western states until the end of World War II, there were attempts to make it illegal for Japanese and other Asian Americans to marry European Americans, but those laws were declared unconstitutional by the U.S. Supreme Court, like the anti-miscegenation laws which prevented European Americans from marrying African Americans in the 1960s. According to a 1990 statistical survey by the Japan Society of America, the Sansei or third generations have an estimated 20 to 30 percent out-of-group marriage, while the 4th generation or Yonsei approaches nearly 50 percent. During the World War II Internment era, the U.S. Executive Order 9066 had an inclusion of orphaned infants with "one drop of Japanese blood" (as explained in a letter by one official) or the order stated anyone at least one-sixteenth Japanese (descended from any intermarriage) lends credence to the argument that the measures were racially motivated, rather than a military necessity. There were sizable numbers of Korean-Japanese, Chinese-Japanese, Filipino-Japanese, Mexican-Japanese, Native Hawaiian-Japanese and Cherokee-Japanese in California according to the 1940 U.S. Census who were eligible for internment as "Japanese" to indicate the first stage of widespread intermarriage of Japanese Americans, including those who passed as "white" or half-Asian/European. Japanese Americans practice a wide range of religions, including Mahayana Buddhism (Jōdo Shinshū, Jōdo-shū, Nichiren, Shingon, and Zen forms being most prominent) their majority faith, Shinto, and Christianity. In many ways, due to the longstanding nature of Buddhist and Shinto practices in Japanese society, many of the cultural values and traditions commonly associated with Japanese tradition have been strongly influenced by these religious forms. A large number of the Japanese American community continue to practice Buddhism in some form, and a number of community traditions and festivals continue to center around Buddhist institutions. For example, one of the most popular community festivals is the annual Obon Festival, which occurs in the summer, and provides an opportunity to reconnect with their customs and traditions and to pass these traditions and customs to the young. These kinds of festivals are mostly popular in communities with large populations of Japanese Americans, such as Southern California and Hawaii. A reasonable number of Japanese people both in and out of Japan are secular, as Shinto and Buddhism are most often practiced by rituals such as marriages or funerals, and not through faithful worship, as defines religion for many Americans. Many Japanese Americans also practice Christianity. Among mainline denominations the Presbyterians have long been active. The First Japanese Presbyterian Church of San Francisco opened in 1885. Los Angeles Holiness Church was founded by six Japanese men and women in 1921. There is also the Japanese Evangelical Missionary Society (JEMS) formed in the 1950s. It operates Asian American Christian Fellowships (AACF) programs on university campuses, especially in California. The Japanese language ministries are fondly known as "Nichigo" in Japanese American Christian communities. The newest trend includes Asian American members who do not have a Japanese heritage. An important annual festival for Japanese Americans is the Obon Festival, which happens in July or August of each year. Across the country, Japanese Americans gather on fair grounds, churches and large civic parking lots and commemorate the memory of their ancestors and their families through folk dances and food. Carnival booths are usually set up so Japanese American children have the opportunity to play together. Japanese American celebrations tend to be more sectarian in nature and focus on the community-sharing aspects. Japanese Americans have shown strong support for candidates in both political parties. Shortly prior to the 2004 US presidential election, Japanese Americans narrowly favored Democrat John Kerry by a 42% to 38% margin over Republican George W. Bush. In the 2008 US presidential election, the National Asian American Survey found that Japanese American favored Democrat Barack Obama by a 62% to 16% margin over Republican John McCain, while 22% were still undecided. The distribution of the Y-chromosome among Japanese males is a lot different from the males of neighboring countries, such as in Taiwanese males. The Y chromosome is directly correlated to Asian populations, especially in Japanese Americans. The chromosome addition of Y Alu polymorphic element is only displayed in Japanese American men. People of Japanese descent show the highest frequency of the haplogroup O3a5. Haplogroups are groups of genetic populations that share a common ancestor, paternally or maternally. The frequency of this haplogroup is about 5% higher than its frequency in other Asian groups such as Koreans, Manchus, and other Northeast Asians. The Japanese DNA sequence consists of 24.2% Korean, 16.1% Okinawa, 4.8% Uniquely Japanese, 25.8% Chinese, 8.1% Ainu, and 21% Unidentified. The Ainu people were the key to the Japanese genetic origins because researchers found an exact DNA match with the Ainu and the Jōmon Japanese to conclude the Ainu rooted all the way back to the Jōmon. From mainland Japanese people, the MtDNA haplogroup frequencies are most occurring in the D4 haplogroup, with about 33%, with the second largest frequency in the B4 haplogroup, containing about 9%, and the third largest frequency in the M7a haplogroup, occurring at about 8%. The rest of the other haplogroup frequencies are much smaller than D4, with frequencies ranging from about 3-5%, consisting of mostly N9a, M8, and M9 haplogroups. Between the different Japanese populations, the Yayoi population has the highest haplogroup frequencies of the D4 haplogroup. The Jōmon Japanese group has the highest frequency of the N9b haplogroup. In modern Japanese Americans, the highest haplogroup frequency is in the D4 haplogroup, the same as the Yayoi Japanese population. In Okinawa Japanese populations, the highest frequency of haplogroups is the D haplogroup, with the M7a haplogroup frequency directly behind. Of the Ainu Japanese population, the highest haplogroup frequency occurs in the Y haplogroup, followed closely by an even distribution of frequency in the D, M7a, and G haplogroups. Lastly, for mainland Japanese populations, the D haplogroup presents the highest frequency. In Japanese Americans, the biggest components are Chinese, Korean, and Okinawan. People of Japanese descent show two pre-Yayoi ancestral Y chromosome lineages descended from Paleolithic people who had been isolated on the mainland of Japan. Studies of the mitochondrial component of Japanese American genes of haplogroup M12 shows a direct correlation of Japanese haplotypes with Tibetans. Other haplotypes that early descents of Japanese people were thought to be carried into include C-M8, which is another Y-chromosome haplotype. Also going back to the Jōmon, that gene is displayed in high frequencies in people of Japanese descent. The estimated percentage of this type of gene in Japanese Americans is about 34.7%. The highest frequencies occur in Okinawans and Hokkaidos. Overall, the genetic makeup of Japanese Americans show very mixed origins of genes, all due to the result of migrations of the Japanese ancestors in the past. Studies have looked into the risk factors that are more prone to Japanese Americans, specifically in hundreds of family generations of Nisei (The generation of people born in North America, Latin America, Hawaii, or any country outside Japan either to at least one Issei or one non-immigrant Japanese parent) second-generation pro-bands (A person serving as the starting point for the genetic study of a family, used in medicine and psychiatry). The risk factors for genetic diseases in Japanese Americans include coronary heart disease and diabetes. One study, called the Japanese American Community Diabetes Study that started in 1994 and went through 2003, involved the pro-bands taking part to test whether the increased risk of diabetes among Japanese Americans is due to the effects of Japanese Americans having a more westernized lifestyle due to the many differences between the United States of America and Japan. One of the main goals of the study was to create an archive of DNA samples which could be used to identify which diseases are more susceptible in Japanese Americans. Concerns with these studies of the risks of inherited diseases in Japanese Americans is that information pertaining to the genetic relationship may not be consistent with the reported biological family information given of Nisei second generation pro-bands. Also, research has been put on concerning apolipoprotein E genotypes; this polymorphism has three alleles (*e2, *e3, and *e4)and was determined from research because of its known association with increased cholesterol levels and risk of coronary heart disease in Japanese Americans. Specifically too, the apolipoprotein *e4 allele is linked to Alzheimer's disease as well. Also, there is increased coronary heart disease in Japanese-American men with a mutation in the cholesterol ester transfer protein gene despite having increased levels of HDL. By definition, HDL are plasma high density lipoproteins that show a genetic relationship with coronary heart disease (CHD). The cholesterol ester transfer protein(CETP) helps the transfer of cholesterol esters from lipoproteins to other lipoproteins in the human body. It plays a fundamental role in the reverse transport of cholesterol to the liver, which is why a mutation in this can lead to coronary heart disease. Studies have shown that the CETP is linked to increased HDL levels. There is a very common pattern of two different cholesterol ester transfer protein gene mutations (D442G, 5.1%; intron 14G:A, 0.5%) found in about 3,469 Japanese American men. This was based off a program called the Honolulu Heart Program. The mutations correlated with decreased CETP levels (-35%) and increased HDL cholesterol levels (+10% for D442G). The relative risk of CHD was 1.43 in men with mutations (P<0.05), and after research found for CHD risk factors, the relative risk went up to 1.55 (P=0.02); after further adjustments for HDL levels, the relative risk went up again to 1.68 (P=0.008). Genetic CETP deficiency is an independent risk factor for coronary heart disease, which is due mainly to increased CHD risks in Japanese American men with the D442G mutation and lipoprotein cholesterol levels between 41 and 60 mg/dl. With research and investigations, the possibility of finding “bad genes” denounces the Japanese Americans and will be associated only with Japanese American ancestry, leading to other issues the Japanese Americans had to deal with in the past such as discrimination and prejudice. In the early 1900s, Japanese Americans established fishing communities on Terminal Island and in San Diego. By 1923, there were two thousand Japanese fishermen sailing out of Los Angeles Harbor. By the 1930s, legislation was passed that attempted to limit Japanese fishermen. Still, areas like San Francisco's Japan Town managed to thrive. Due to the internment of Japanese Americans during World War II, historically Japanese areas fell into disrepair or became adopted by other minority groups (in the case of Black and Latino populations in Little Tokyo). Boats owned by Japanese Americans were confiscated by the U.S. Navy. One of the vessels owned by a Japanese American, the Alert, built in 1930, became YP-264 in December 1941, and was finally struck from the Naval Vessel Register in 2014. When Japanese Americans returned from internment, many settled in neighborhoods where they set up their own community centers in order to feel accepted. Today, many have been renamed cultural centers and focus on the sharing of Japanese culture with local community members, especially in the sponsorship of Obon festivals. The city of Torrance in Greater Los Angeles has headquarters of Japanese automakers and offices of other Japanese companies. Because of the abundance of Japanese restaurants and other cultural offerings are in the city, and Willy Blackmore of L.A. Weekly wrote that Torrance was "essentially Japan's 48th prefecture". The Japanese School of New York is located in Greenwich, Connecticut in Greater New York City; it had formerly been located in New York City. The Seigakuin Atlanta International School is located in Peachtree Corners in Greater Atlanta. As of 2011 there is a Japanese community in Arlington Heights, near Chicago. Jay Shimotake, the president of the Mid America Japanese Club, an organization located in Arlington Heights, said "Arlington Heights is a very convenient location, and Japanese people in the business environment know it's a nice location surrounding O'Hare airport." The Chicago Futabakai Japanese School is located in Arlington Heights. The Mitsuwa Marketplace, a shopping center owned by Japanese, opened around 1981. Many Japanese companies have their US headquarters in nearby Hoffman Estates and Schaumburg. As of April 2013, the largest Japanese national population in Michigan is in Novi, with 2,666 Japanese residents, and the next largest populations are respectively in Ann Arbor, West Bloomfield Township, Farmington Hills, and Battle Creek. The state has 481 Japanese employment facilities providing 35,554 local jobs. 391 of them are in Southeast Michigan, providing 20,816 jobs, and the 90 in other regions in the state provide 14,738 jobs. The Japanese Direct Investment Survey of the Consulate-General of Japan, Detroit stated that over 2,208 more Japanese residents were employed in the State of Michigan as of October 1, 2012, than had been in 2011. As of March 2011 about 2,500 Japanese Americans combined live in Edgewater and Fort Lee; this is the largest concentration of Japanese Americans in the state. The New Jersey Japanese School is located in Oakland. Other smaller Japanese American populations are also located in the remainder of Bergen County and other parts of the state. Mitsuwa Marketplace has a location in Edgewater that also houses a mini shopping complex. There are about 5,500 Japanese Americans in Northern Virginia, representing the majority of Japanese Americans in the state and the multi-state Baltimore-Washington metropolitan area. A small, but relatively high number of Japanese Americans can be found areas surrounding the University of Virginia and Virginia Tech. Cerritos, Hawaiian Gardens and adjacent cities. Fontana in the Inland Empire. Gardena in Los Angeles' South Bay area. Lomita in the L.A. area. Long Beach, California – historic Japanese fisheries presence in Terminal Island. Los Angeles, includes the Little Tokyo section. Palm Desert, the Japanese also developed the year-round agricultural industries in the Coachella Valley and Imperial Valley. Pasadena in the Los Angeles' San Gabriel Valley. Santa Monica - esp. Blacks Beach. Sawtelle, California, in West Los Angeles. Torrance in Los Angeles' South Bay area. Venice, Los Angeles - historically Japanese fisheries in Marina Del Rey. Japanese community center in Vista in North County, one of two of its kind in Southern California. Fresno, 5% of county residents have Japanese ancestry. Livingston, California in Merced County. Alameda County, concentrated and historic populations in the cities of Alameda, Berkeley, Fremont, Oakland, and Hayward. Contra Costa County, concentrated in Walnut Creek. San Mateo County, especially Daly City and Pacifica. 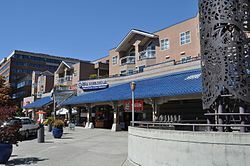 San Jose, has one of the three remaining officially recognized Japantowns in North America. Santa Clara County, concentrated in Cupertino, Palo Alto, Santa Clara, and Sunnyvale. San Francisco, notably in the Japantown district, the largest Japanese community in North America. Monterey County, especially Salinas, California. Sacramento, and some neighborhoods of Florin and Walnut Grove. Puget Sound region (San Juan Islands) have Japanese fisheries for over a century. Phoenix Area, notably a section of Grand Avenue in Northwest Phoenix, and Maryvale. Las Vegas Area, with a reference of Japanese farmers on Bonzai Slough, Arizona near Needles, California. Southern Arizona, part of the "exclusion area" for Japanese internment during World War II along with the Pacific coast states. On the East Coast of the United States, the New York metropolitan area has the highest number of Japanese Americans, followed by the Washington metropolitan area. Arlington, Virginia and Alexandria, Virginia (the Northern Virginia region). Elk Grove Heights and nearby Elk Grove Village. Denver, Colorado, note Sakura Square. Fayetteville, North Carolina - close to the Research Triangle. Gallup, New Mexico, in World War II the city fought to prevent the internment of its 800 Japanese residents. Grand Prairie, Texas (the Dallas-Fort Worth Metroplex area). Japan, North Carolina - former town bulldozed by dam construction. New York City, New York, according to the Japanese Embassy of the US, over 100,000 persons of Japanese ancestry live in the NYC metro area, including South Shore (Long Island) and Hudson Valley; Fairfield County, Connecticut and Northern New Jersey. Northern Indiana has a small, but evident Japanese community. Philadelphia, Pennsylvania with the suburbs of Chester County. 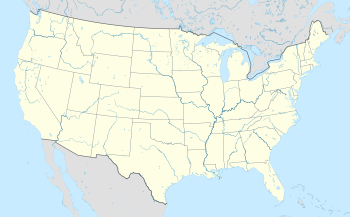 Salem, New Jersey and Cherry Hill, New Jersey (see Delaware Valley). South Texas - Rio Grande Valley had Japanese farmers. Washington, DC and suburbs in Maryland and Northern Virginia. Yamato Colony, Florida in South Florida. For a more comprehensive list, see List of Japanese Americans. Senator Inouye of Hawaii was named the President pro tempore of the United States Senate in 2010, becoming the highest ranking Asian American in congressional history. After the Territory of Hawaiʻi's statehood in 1959, Japanese American political empowerment took a step forward with the election of Daniel K. Inouye to Congress. Spark Matsunaga was elected to the US House of Representatives in 1963, and in 1965 Patsy Mink became the first Asian American woman elected to the United States Congress. Inouye, Matsunaga, and Mink's success led to the gradual acceptance of Japanese American leadership on the national stage, culminating in the appointments of Eric Shinseki and Norman Y. Mineta, the first Japanese American military chief of staff and federal cabinet secretary, respectively. Japanese American members of the United States House of Representatives have included Daniel K. Inouye, Spark Matsunaga, Patsy Mink, Norman Mineta, Bob Matsui, Pat Saiki, Mike Honda, Doris Matsui, Mazie Hirono, Mark Takano, and Mark Takai. Japanese American members of the United States Senate have included Daniel K. Inouye, Samuel I. Hayakawa, Spark Matsunaga, and Mazie Hirono. In 2010, Inouye was sworn in as President Pro Tempore making him the highest-ranking Asian-American politician in American history. George Ariyoshi served as the Governor of Hawaiʻi from 1974 to 1986. He was the first American of Asian descent to be elected governor of a state of the United States. David Ige is the current governor of Hawaii and has served in that office since 2014. Many Japanese Americans have also gained prominence in science and technology. In 1979, biochemist Harvey Itano became the first Japanese American elected to the United States National Academy of Sciences. Charles J. Pedersen won the 1987 Nobel Prize in Chemistry for his methods of synthesizing crown ethers. 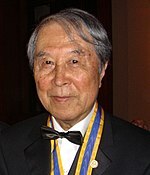 Yoichiro Nambu won the 2008 Nobel Prize in Physics for his work on quantum chromodynamics and spontaneous symmetry breaking. Shuji Nakamura won the 2014 Nobel Prize in Physics for the invention of efficient blue light-emitting diodes. Michio Kaku is a theoretical physicist specializing in string field theory, and a well-known science popularizer. Ellison Onizuka became the first Asian American astronaut and was the mission specialist aboard Challenger at the time of its explosion. Immunologist Santa J. Ono became the first Japanese American president of a major research university University of Cincinnati and subsequently University of British Columbia. Bell M. Shimada was a notable fisheries scientist of the 1950s after whom the National Oceanic and Atmospheric Administration research ship NOAAS Bell M. Shimada (R 227) and the Shimada Seamount in the Pacific Ocean were named. Artist Sueo Serisawa helped establish the California Impressionist style of painting. Other influential Japanese American artists include Chiura Obata, Isamu Noguchi, Kenjiro Nomura, George Tsutakawa, George Nakashima, Hideo Noda, and Ruth Asawa. Architect Minoru Yamasaki designed the original World Trade Center and several other large-scale projects. Gyo Obata designed the National Air and Space Museum in Washington, D.C and the pavilion of the Japanese American National Museum in Los Angeles. Japanese American recipients of the American Book Award include Milton Murayama, Ronald Phillip Tanaka, Miné Okubo, Keiho Soga, Taisanboku Mori, Sojin Takei, Muin Ozaki, Toshio Mori, William Minoru Hohri, Karen Tei Yamashita, Sheila Hamanaka, Lawson Fusao Inada, Ronald Takaki, Kimiko Hahn, Lois-Ann Yamanaka, Ruth Ozeki, Hiroshi Kashiwagi, and Yuko Taniguchi. Hisaye Yamamoto received an American Book Award for Lifetime Achievement in 1986. Cynthia Kadohata won the Newbery Medal in 2005. Poet laureate of San Francisco Janice Mirikitani has published three volumes of poems. Lawson Fusao Inada was named poet laureate of the state of Oregon. Michi Weglyn and Ronald Takaki received Anisfield-Wolf Book Awards in 1977 and 1994 respectively. Tomie Arai's work is part of permanent collection of Museum of Modern Art, Library of Congress, and the Museum of Chinese in the Americas. Michiko Kakutani is an American Pulitzer Prize-winning literary critic and former chief book critic for The New York Times. Classical violinist Midori Gotō is a recipient of the prestigious Avery Fisher Prize, while world-renowned violinist Anne Akiko Meyers received an Avery Fisher career grant in 1993. Juno Award-nominated classical violinist Hidetaro Suzuki was the concertmaster of the Indianapolis Symphony Orchestra from 1978 to 2005. Other notable Japanese American musicians include singer, actress and Broadway star Pat Suzuki; rapper Mike Shinoda of Linkin Park and Fort Minor; rapper Kikuo Nishi aka "KeyKool" of The Visionaries; Hiro Yamamoto, original bassist of Soundgarden; ukulele player Jake Shimabukuro; guitarist James Iha of The Smashing Pumpkins fame; singer-songwriter Rachael Yamagata; bilingual singer-songwriter Emi Meyer; and Trivium lead vocalist and rhythm guitarist Matt Heafy. Marc Okubo, guitarist of Veil of Maya, is of Japanese descent. Singer-songwriter and composer Mari Iijima is a Japanese expat currently living in the United States. J-Pop singers Hikaru Utada and Joe Inoue were both born in the United States but gained their fame in Japan. Japanese Americans first made an impact in Olympic sports in the late 1940s and in the 1950s. Harold Sakata won a weightlifting silver medal in the 1948 Olympics, while Japanese Americans Tommy Kono (weightlifting), Yoshinobu Oyakawa (100-meter backstroke), and Ford Konno (1500-meter freestyle) each won gold and set Olympic records in the 1952 Olympics. Konno won another gold and silver swimming medal at the same Olympics and added a silver medal in 1956, while Kono set another Olympic weightlifting record in 1956. Also at the 1952 Olympics, Evelyn Kawamoto won two bronze medals in swimming. Several decades later, Eric Sato won gold (1988) and bronze (1992) medals in volleyball, while his sister Liane Sato won bronze in the same sport in 1992. Bryan Clay (hapa) won the decathlon gold medal in the 2008 Olympics, the silver medal in the 2004 Olympics, and was the sport's 2005 world champion. Apolo Anton Ohno (hapa) won eight Olympic medals in short-track speed skating (two gold) in 2002, 2006, and 2010, as well as a world cup championship. Brothers Kawika and Erik Shoji won bronze medals in volleyball in 2016. In figure skating, Kristi Yamaguchi, a fourth-generation Japanese American, won three national championship titles (one in singles, two in pairs), two world titles, and the 1992 Olympic gold medal in singles figure skating. Rena Inoue, a Japanese immigrant to America who later became a US citizen, competed at the 2006 Olympics in pair skating for the United States. Kyoko Ina, who was born in Japan, but raised in the United States, competed for the United States in singles and pairs, and was a multiple national champion and an Olympian with two different partners. Two-time Olympian Mirai Nagasu won the 2008 U.S. Figure Skating Championships at the age of 14, becoming the second youngest woman to ever win that title. Alex and Maia Shibutani are two-time national champions in ice dancing and 2018 Olympic bronze medalists. In distance running, Miki (Michiko) Gorman won the Boston and New York City marathons twice in the 1970s. A former American record holder at the distance, she is the only woman to win both races twice, and is one of only two women to win both marathons in the same year. In professional sports, Wataru Misaka broke the NBA color barrier in the 1947–48 season, when he played for the New York Knicks. Misaka also played a key role in Utah's NCAA and NIT basketball championships in 1944 and 1947. Wally Kaname Yonamine was a professional running back for the San Francisco 49ers in 1947. Rex Walters, whose mother was Japanese, played in the NBA from 1993 to 2000. Lindsey Yamasaki was the first Asian American to play in the WNBA and finished off her NCAA career with the third-most career 3-pointers at Stanford University. Hikaru Nakamura became the youngest American ever to earn the titles of National Master (age 10) and International Grandmaster (age 15) in chess. In 2004, at the age of 16, he won the U.S. Chess Championship for the first time. He later won two other times. Miyoshi Umeki won the Academy Award for Best Supporting Actress in 1957. Actors Sessue Hayakawa, Mako Iwamatsu, and Pat Morita were nominated for Academy Awards in 1957, 1966, and 1984 respectively. Chris Tashima won the Academy Award for Best Live Action Short Film in 1997. Jack Soo, born Goro Suzuki, (Valentine's Day and Barney Miller), George Takei (Star Trek fame) and Pat Morita (Happy Days and The Karate Kid) helped pioneer acting roles for Asian Americans while playing secondary roles on the small screen during the 1960s and 1970s. In 1976, Morita also starred in Mr. T and Tina, the first American sitcom centered on a person of Asian descent. Keiko Yoshida appeared on the TV show ZOOM on PBS Kids. Gregg Araki (director of independent films) is also Japanese American. Shin Koyamada had a leading role in the Warner Bros. epic movie The Last Samurai and Disney Channel movie franchise Wendy Wu: Homecoming Warrior and TV series Disney Channel Games. Masi Oka played a prominent role in the NBC series Heroes, Grant Imahara appeared on the Discovery Channel series MythBusters and Derek Mio appeared in the NBC series Day One. Ryan Potter, an actor is also a Japanese American. Japanese Americans now anchor TV newscasts in markets all over the country. Notable anchors include Tritia Toyota, Adele Arakawa, David Ono, Kent Ninomiya, Lori Matsukawa, and Rob Fukuzaki. See also: the categories Films about the internment of Japanese Americans and Books about the internment of Japanese Americans. In 2010 TBS produced a five-part, ten-hour fictional Japanese language miniseries, Japanese Americans. This featured many of the major events and themes of the Issei and Nisei experience, including emigration, racism, picture brides, farming, pressure due to the China and Pacific wars, internment, a key character who serves in the 442nd, and the ongoing redefinition in identity of what it means to be Japanese and American. ^ a b "ASIAN ALONE OR IN ANY COMBINATION BY SELECTED GROUPS: 2017". U.S. Census Bureau. Retrieved November 8, 2018. ^ "Japanese Americans - Pew Forum on Religion & Public Life". Retrieved March 17, 2015. ^ Data Access and Dissemination Systems (DADS). "American FactFinder - Results". Retrieved March 17, 2015. ^ "Redirect". Retrieved March 17, 2015. ^ "Toyota built Torrance into the second-largest home of Japanese Americans. Now, it's leaving". ^ "Civil Liberties Act of 1988". Archived from the original on January 17, 2012. ^ "Euphemisms, Concentration Camps And The Japanese Internment". ^ Doi, Mary L. "A Transformation of Ritual: The Nisei 60th Birthday." Journal of Cross-Cultural Gerontology. Vol. 6, No. 2 (April, 1991). ^ Le, Cuong. "Socioeconomic Statistics & Semographics". Retrieved April 17, 2012. ^ Endo, R. (Hamline University). "Realities, Rewards, and Risks of Heritage-Language Education: Perspectives from Japanese Immigrant Parents in a Midwestern Community." Bilingual Research Journal, 2013, Vol.36(3), p.278-294. CITED: p. 279. ^ Ronald T, Takaki (1994). Issei and Nisei: The Settling of Japanese America. New York: Chelsea House. ^ Endo, R. (Hamline University). "Realities, Rewards, and Risks of Heritage-Language Education: Perspectives from Japanese Immigrant Parents in a Midwestern Community." Bilingual Research Journal, 2013, Vol.36(3), p.278-294. CITED: p. 280. ^ a b "私立在外教育施設一覧" (). Ministry of Education, Culture, Sports, Science and Technology. Retrieved on March 1, 2015. ^ "北米の補習授業校一覧（平成25年4月15日現在）." (Archive) Ministry of Education, Culture, Sports, Science and Technology. Retrieved on May 5, 2014. ^ Endo, R. (Hamline University). "Realities, Rewards, and Risks of Heritage-Language Education: Perspectives from Japanese Immigrant Parents in a Midwestern Community." Bilingual Research Journal, 2013, Vol.36(3), p.278-294. CITED: p. 281. ^ "Endo Presents and Leads at Conference" (Archive). Hamline University. April 20, 2012. Retrieved on March 4, 2015. ^ Endo, R. (Hamline University). "Realities, Rewards, and Risks of Heritage-Language Education: Perspectives from Japanese Immigrant Parents in a Midwestern Community." Bilingual Research Journal, 2013, Vol.36(3), p.278-294. CITED: p. 282. ^ Brian Niiya (1993). Japanese American History: An A-To-Z Reference from 1868 to the Present. VNR AG. p. 28. ISBN 9780816026807. ^ Sugimura, Tsukasa. A History of the OMS Holiness Church of North America. Education and Publication Committee of the OMS Holiness Church of North America, 1993. ^ Hans Joachim Hillerbrand (2004). The Encyclopedia of Protestantism. Taylor & Francis. p. 197. ISBN 9780203484319. ^ Robert A. Orsi (1999). Gods of the City: Religion and the American Urban Landscape. Indiana UP. p. 299. ISBN 0253212766. ^ "Making sense of DNA data and the origins of the Japanese". Heritage of Japan. February 27, 2009. Retrieved December 5, 2016. ^ "Genetic structure of the Japanese and the formation of the Ainu population" (PDF). ^ "Jomon Genes Using DNA, researchers probe the genetic origins of modern Japanese". ^ "Genetics of the Metabolic Syndrome in Japanese Americans - Full Text View - ClinicalTrials.gov". clinicaltrials.gov. Retrieved December 5, 2016. ^ Zhong, S; Sharp, D S; Grove, J S; Bruce, C; Yano, K; Curb, J D; Tall, A R (June 15, 1996). "Increased coronary heart disease in Japanese-American men with mutation in the cholesteryl ester transfer protein gene despite increased HDL levels". Journal of Clinical Investigation. 97 (12): 2917–2923. doi:10.1172/JCI118751. ISSN 0021-9738. PMC 507389. PMID 8675707. ^ Austin, Melissa A. (April 1, 2002). "Ethical issues in human genome epidemiology: a case study based on the Japanese American Family Study in Seattle, Washington". American Journal of Epidemiology. 155 (7): 585–592. doi:10.1093/aje/155.7.585. ISSN 0002-9262. PMID 11914185. ^ a b Felando, August; Medina, Harold (Winter 2012). "The Origins of California' High-Seas Tuna Fleet" (PDF). Journal of San Diego History. San Diego History Center. 58 (1). Retrieved April 6, 2015. ^ Western Canner and Packer. Miller Freeman Publications of California. 1922. p. 36. ^ Andrew F. Smith (2012). American Tuna: The Rise and Fall of an Improbable Food. University of California Press. pp. 63–69. ISBN 978-0-520-26184-6. ^ "San Diego Marine Construction, San Diego CA". Shipbuilding History. June 27, 2014. Retrieved April 6, 2015. ^ Gary P. Priolo (February 14, 2014). "YP-264". NavSource Naval History. Retrieved April 6, 2015. ^ "A Marker of the Past, a Warning for the Future". The Argonaut Newspaper. May 4, 2017. Retrieved May 7, 2017. ^ Blackmore, Willy. "Top 10: Japanese Noodles Shops in Torrance." L.A. Weekly. Retrieved on May 10, 2013. ^ a b Selvam, Ashok. "Asian population booming in suburbs." Daily Herald (Arlington Heights, Illinois). March 6, 2011. Retrieved on June 19, 2013. ^ Stone, Cal (April 11, 2013). "State's Japanese employees increasing". Observer & Eccentric. Detroit. Archived from the original on May 5, 2013. Retrieved May 5, 2013. ^ Stirling, Stephen. "Japanese Americans in Fort Lee, Edgewater describe frantic calls to loved ones in quake's wake." The Star-Ledger. Friday, March 11, 2011. Updated Saturday, March 12, 2011. Retrieved on June 19, 2013. ^ "Japanese Superstore in New Jersey Offers Exotica, From Katsu to Kitsch". November 23, 2016 – via NYTimes.com. ^ June Casagrande (December 2004). "Holiday Heritage". Orange Coast Magazine. 30 (12): 174–176. ^ "D.C. region's Asian population is up 60 percent since 2000, census data show". The Washington Post. ^ Niiya, Brian (1993). Japanese American History. Japanese American National Museum (Los Angeles, Calif.): VNR AG. p. 307. ISBN 0816026807. ^ "NOAA and the Preserve America Initiative". preserveamerica.noaa.gov. ^ "NOAA Honors Nisei with Launch of Fisheries Vessel "Bell M. Shimada"". www.nvcfoundation.org. ^ ""...First male Japanese-American TV anchor in Los Angeles local TV News."". a.abclocal.go.com. Retrieved February 7, 2017. Azuma, Eiichiro. "A History of Oregon's Issei, 1880-1952." Oregon Historical Quarterly. Oregon Historical Society. Vol. 94, No. 4, Winter, 1993/1994., pp. 315–367. Available on JStor. DeWan, George. "Learning How To Stay Japanese In America." Newsday. January 6, 1990. PART 11, Start page NOPGCIT. Hosokawa, Bill. Nisei, the Quiet Americans (1969). Inouye, Karen M., “Changing History: Competing Notions of Japanese American Experience, 1942–2006” (PhD dissertation Brown University, 2008). Dissertation Abstracts International No. DA3318331. Kikumura-Yano, Akemi, ed. "Encyclopedia of Japanese Descendants in the Americas." Walnut Creek, CA: Rowman & Littlefield Publishers, 2002. Lai, Eric, and Dennis Arguelles, eds. "The New Face of Asian Pacific America: Numbers, Diversity, and Change in the 21st century." San Francisco, CA: Asian Week, 2003. Miyakawa, Tetsuo Scott. East across the Pacific: historical & sociological studies of Japanese immigration & assimilation (ABC-CLIO, 1972). Thernstrom, Stephan; Ann Orlov; Oscar Handlin (1980). "Japanese". Harvard Encyclopedia of American Ethnic Groups (2 ed.). Harvard University Press. pp. 561–562. ISBN 0-674-37512-2. "United States Census 2000". United States Census Bureau. April 2000. Retrieved March 16, 2007. Asato, Noriko (September 2005). Teaching Mikadoism: The Attack on Japanese Language Schools in Hawaii, California, and Washington, 1919-1927. Honolulu: University of Hawaii. Kono, Hideto; Sinoto, Kazuko (2000). "Observations of the first Japanese to Land in Hawai'i" (PDF). The Hawaiian Journal of History. 34: 49–62. Kawakami, Barbara F. Japanese immigrant clothing in Hawaii, 1885-1941 (University of Hawaii Press, 1995). Morgan, William. Pacific Gibraltar: U.S.-Japanese Rivalry over the Annexation of Hawai'i, 1885-1898 (Naval Institute Press, 2011). Morimoto, Toyotomi (1997). Japanese Americans and Cultural Continuity: Maintaining Language through Heritage. Routledge. Takagi, Mariko (1987). Moral Education in Pre-War Japanese Language Schools in Hawaii. Honolulu: University of Hawaii. Wikimedia Commons has media related to Japanese diaspora in the United States. "Japanese Americans". (Archive) State of California. Short radio episode Baseball from "Lil' Yokohama" by Toshio Mori, 1941. California Legacy Project. This page was last edited on 24 April 2019, at 04:31 (UTC).